Books for UPSC Civil Service Main Exam overlap with many books recommended for Prelims. But Mains stage demands certain additional books as there are new topics like Foreign Relations, Internal Security, Ethics etc. We suggest a mix of NCERT Books, Government websites, newspapers along with new textbooks in the market for mains preparation. Don’t forget to read our online study materials for mains too. The mentioned books are based on the feedback from many aspirants/toppers who found them useful for the exam. We keep updating this page when new books worth the time and money of candidate appear in the market. So come back to check this page again! Sociology Optional: Books for Mains Exam. Public Administration Optional: Books for Mains Exam. History Optional: Books for Mains Exam. Geography Optional: Books for Mains Exam. Economics Optional: Books for Mains Exam. Philosophy Optional: Books for Mains Exam. Psychology Optional: Books for Mains Exam. Agriculture Optional: Books for Mains Exam. Political Science Optional: Books for Mains Exam. IAS Books Mains General Studies – For more reference in GS1, GS2, G3 and G4. 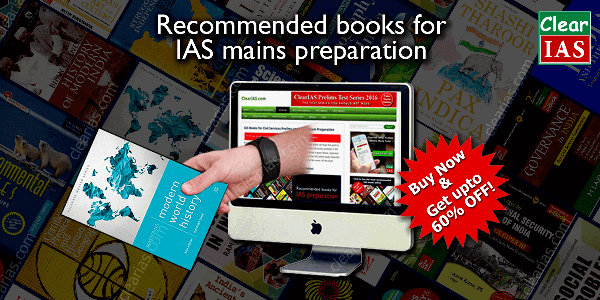 Free IAS Study Materials for UPSC Prelims and Mains. 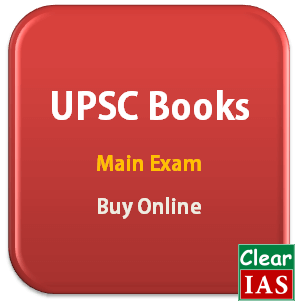 UPSC Books at Online Stores! Sir, if i am appearing for ias – 2014 when shall i start making notes out of daily newspaper. shall i start it by now or after mains 2013. although i am reading newspaper regularly but what is right tme to take notes. Sorry for not keeping tracking of all comments…But to answer your query, note taking is advised from Day1. But it should be done on priority basis after Mains 2013. Sir I have tmh general studies.i recently bought Access Publishing general studies paper 1 and 2 which is very good too with all good authors.sir have you gone through these two later books. Sir, Cannot open Socialogy books link… Plz Fix it… 4 Sociology – Civil Services Books – Mains Exam. Thanks a lot for pointing out that. The link issue is fixed. Let us know if you find any further difficulties. I find no books on Anthropology for CIvil Services Main exam. would you kindly suggest me. i’m looking for on line or postal coaching for civil service(main) exam…. please inform me…. Great to know about that. All the best! This site is very useful for IAS aspirants. Can u pls post the books needed to prepare for Electrical Engineering optional. You may expect a post on Political Science optional, strategies and books to read soon. SIR, My birth date in 1995 year…what am i eligible for civil service exam-2016? Can we use second hand/old edition books for the preperation? Could you please suggest books for the optional subject Mathematics in mains? I mean do i need to go through std 6-12 books or should I start with the books above mentioned? plz suggest me maths books for optional. plz suggest me maths books for optional.also give me some important strategy for this subject. A good and amuch useful site.very useful and good for ias aspirants.i have download it today and find it good. An assamese medium is allowed for main written exam of all (except English) GS i-iv and optional subject. Please provide details. Great to know that aspirants like you are taking the best out of ClearIAS app. All the best! Sir, i shall be thankful to you if you kindly suggest a books for UPSC main 2016 with the latest edition. Which are the optional subjects.. in which stage shoul i choose it in prelims or mains. ?? Hello sir my name is Saiyam and my dream is to become an IAS OFFICE but I am little bit confused related to the books that I should refer and also I want that some guide line so that I can be on the right track for becoming an IAS OFFICE and transforming my dream in to the reality …… So sir can u plzz help me by giving your guidance ………. Sir, I am Master in fisheries with double graduation, one in zoology and other in fisheries (B. F.Sc.). I want to prepare and qualify IAS exam and I know only a little about it. Can you please help me in advising that how to start and how much knowledge is required. Actually, the problem with me is that I know very much about fisheries and zoology but my general knowledge is very poor. I am complete double degree graduation,one in history,and other in law.and. I have take admission in IGNOU in MA history,am very confused can you p/s help me in advising that how to start and I decided to take history as my optional subject.so I need a reference book I want ur suggestion.p/s help me. sir me ias ki teyari karna chata hu is ke liye kon si book lu. Sir, I am a commerce graduate, I am worried about my optional papers. My first query, is it mandatory to choose two(2) optional paper? and another you does not share any link for commerce stream. If you share some idea it will be help full to me. I am still unable to choose 2nd optional paper (1st, Commerce & Accountancy). So please help me and suggest some books on commerce stream. Sir good morning i am rajesh .i am confused that how to start prepartion for ias .and suggest me some books for ias exam and geography main books. I am a BALLB 1st sem student.I am interested too in social service.To serve the society IAS is the only platform for me.But I am in confusion that from where I should start my preparation. And also I want to take law as an optional .sir, plz suggest me. Sir Im preparing with Geography as optional. But I really don’t have any idea for General studies Paper 1, 2,3,4 for Main.. Can you suggest me some best book .. please reply and also reply about the books about their speciality. Sir, now I passed 12th class & after graduation I want to give ias exam , which books I should read which mainly not changed & how I should prepare for that. I need some books to suggested for anthropology optional ..I kindly request you to suggest me.. In your website, only sociology optional book list is seen instead of respective optional when selected, so kindly make a change in your website, so, the aspirants would have a chance to view the books list for other optional too. @Gopi: Thank you for bringing this to our notice. We have updated the links now. Sir if I select marathi language in ias mains exam, then are the optional subject in marathi language. Sir,First off aĺ thank you so much for guiding us. Please share your views regarding zoology as a optional,as my subject was zoology till my graduation. After graduation i have stopped my academics,Sir please give your suggestion. Firstly, thankyou so much for this wonderful opportunity. Can you list out the books for management subject as optional? sir,I want to take optional subject as physics.Please suggest me the books and notes.Want your Help. ARE YOU SURE THAT I WILL BE ABLE TO CLEAR UPSC AFTER READING ALL THIS BOOKS..? ?